Does your fitted sheet get on your nerves? Does it pop off the corners? Do you try folding it and end up rolling it up in a ball? Do you scrape your knuckles trying to get the last corner on? Does it hijack your socks in the dryer? If you said yes to any of these questions, we think you'll love QuickZip. QuickZip is the fitted sheet reinvented, the Fitted Sheet 2.0 for you high-tech folks. 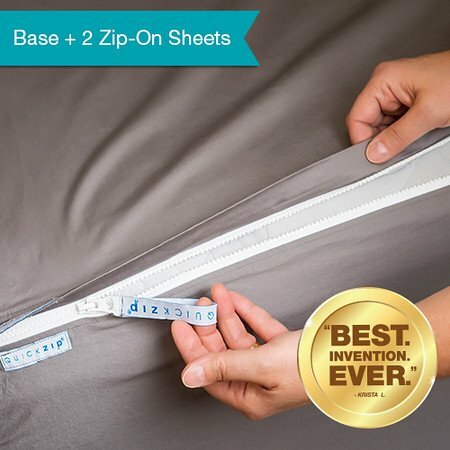 QuickZip is a patented two-piece fitted sheet that easily zips off and on. It goes on like a regular fitted sheet, but the fitted part stays securely on the mattress (it has a wide elastic band that secures the base under the mattress and elastic throughout the side panels so the base hugs the mattress). QuickZip is perfect for hard to reach mattresses like bunk beds, lofts, trundle beds, daybeds, beds with drop-in frames. It's also amazing for adjustable beds, split king beds and for people with arthritis or other hand mobility issues, QuickZip is a game changer. Join the thousands of people who love QuickZip and declare they will never go back to regular fitted sheets. Our 2 Pack Includes (2) Zip-On Sheets and (1) Fitted Base. It's like having two fitted sheets for one mattress. Fits Standard size Queen Mattresses (80"X60") up to 15" thick. Flat Sheet & Pillowcases NOT INCLUDED. DOES YOUR FITTED SHEET GET ON YOUR NERVES? Does it pop off the corners? Do you try folding it and end up rolling it up in a ball? Do you scrape your knuckles trying to get the last corner on? Does it hijack your socks in the dryer? If you said yes to any of these questions, we think you'll love QuickZip. QuickZip is the FITTED SHEET REINVENTED, the Fitted Sheet 2.0 for you high-tech folks. QuickZip is a patented two-piece fitted sheet that easily zips off and on. NEVER ADJUST THE SHEET AGAIN. The fitted part stays securely on the mattress (it has a wide elastic band that secures the base under the mattress and elastic throughout the side panels so the base hugs the mattress). And since you're not washing the base very often, it will last longer and stay put for many years. FOLDING IS A PIECE OF CAKE since all you're folding is the zip-on sheet. PERFECT FOR HARD TO REACH MATTRESSES like bunk beds, lofts, trundle beds, daybeds, beds with drop-in frames. It's also amazing for adjustable beds, split king beds and for people with arthritis or other hand mobility issues, QuickZip is a game changer. Our 2 Pack Includes (2) Zip-On Sheets and (1) Fitted Base. Fits Standard size Queen Mattresses (80"X60") up to 15" thick. Flat Sheet & Pillowcases NOT included. KEY FEATURES INCLUDE: Premium quality YKK Zipper; Easy access corner zipper start location, Zipper start locator logo ribbon on both base and zip-on sheet, Large zipper pull ribbon loop, Deep pocked fitted base. Our 400-THREAD-COUNT Luxurious SATEEN Cotton Zip-On Sheet is soft and smooth against your skin with a subtle luminous sheen. FOR BEST RESULTS: The Zip-On Sheet comes partially zipped onto the fitted base; zip the rest of the sheet together before washing. Our sheets are pre-shrunk, but please wash and dry the sheet before putting it on the mattress to ensure the best fit. Slip on mattress like a regular fitted sheet. If you have any questions about this product by QuickZip, contact us by completing and submitting the form below. If you are looking for a specif part number, please include it with your message.